New Samsung Atmos soundbar adjusts sound based on what's on screen | What Hi-Fi? Samsung has announced two new soundbars for 2019, the Dolby Atmos-supporting HW-Q70R and non-Atmos HW-Q60R. 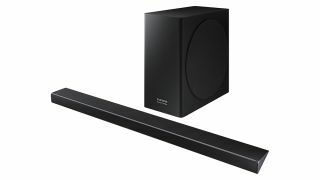 No doubt designed to be paired with one of the brand's QLED TVs – even the naming is in line with that of its QLED range – the soundbars are a product of a collaboration between Samsung and its subsidiary Harman Kardon, aim to create an immersive, cinematic experience from their soundbar and subwoofer forms. They're being billed as 'smarter than ever' thanks to two proprietary technologies: Adaptive Sound and Samsung Acoustic Beam. The former can supposedly analyse the content playing on a connected TV and dynamically optimise its sound settings accordingly on a scene-per-scene basis. If either of the new Q Series soundbars is used with a 2019 Samsung QLED TV, Adaptive Sound mode is activated automatically. Acoustic Beam technology, meanwhile, has been incorporated into previous Samsung soundbars, such as the HW-6N50, and uses a smattering of holes in the soundbar that are designed to work like extra speakers to create a wider, more dynamic soundfield. There's no wi-fi, but Bluetooth is present and correct for music playback. The HW-Q70R soundbar supports Dolby Atmos and DTS:X surround sound formats, promising to make the most of such soundtracks when playing them from, say, Netflix or 4K Blu-rays. Both new Q Series soundbars, available in April, sit below Samsung's flagship HW-N950 Atmos soundbar/surround sound hybrid package (£1199) and HW-N850 (£899). The HW-Q60R costs £600, while the HW-Q70R is priced £800 - promising for an Atmos soundbar, that's for sure.